We had the chance to interview Ingrid Law about her books Savvy and Scumble as well as where she might take the series with a potential third book in the series. We hope that you enjoy it! WaldenFans.com: Tell us a bit about yourself, for our readers that might not know much about you. Ingrid: I was born in New York, but my family moved to Colorado when I was six years old. I still live in Colorado with my daughter, who is sixteen now. We both love movies and books and writing. 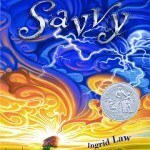 My first book, Savvy, came out in 2008 and was published by Dial Books, in partnership with Walden Media. 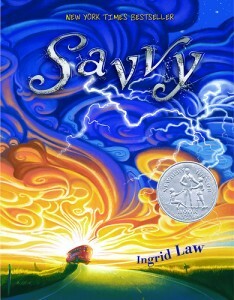 Among Savvy’s accolades and awards, it has received a Newbery Honor and a Boston Globe – Horn Book Honor; it became a New York Times bestseller, and was selected by Oprah Winfrey and Al Roker for their reading lists and book clubs. Savvy was also optioned for a feature film by Walden Media. I followed up Savvy with a companion book, titled Scumble, which came out in 2010 and immediately became a New York Times bestseller. I never expected such an amazing response to my books. I feel very blessed, not only because of the success of the books, but because of the wonderful people I’ve had a chance to meet and work with because of them. WaldenFans.com: Can you give us a quick teaser for each of the Savvy books that will give us an idea of what we’re in for? Ingrid: In Savvy, Mibs Beaumont is about to become a teenager. As if that weren’t scary enough, thirteen is when a Beaumont’s savvy strikes–and with one brother who causes hurricanes and another who creates electricity, Mibs’s birthday promises to be outrageous. But just before her big day, Poppa is in a terrible accident. Suddenly, Mibs’s dreams of X-ray vision disappear like a flash of her brother’s lightning: All she wants now is a savvy that will save Poppa. In fact, Mibs is so sure she’ll get that powerful savvy that she sneaks a ride to the hospital on a rickety bus, with her siblings and the preacher’s kids in tow. But when the bus starts heading in the wrong direction only one thing is certain: After this extraordinary adventure, not a soul on board will ever be the same. 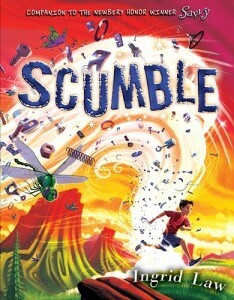 Scumble, a companion to Savvy, takes place nine years after Mibs’s adventure and stars her cousin, Ledger Kale. Ledge thinks his savvy is a total dud—all he does is make little things fall apart. So his parents decide it’s safe to head to Wyoming for a family wedding, where it’s soon revealed that Ledge’s savvy is much more powerful than anyone thought. Worse, his savvy disaster has an outside witness: Sarah Jane Cabot, reporter wannabe and daughter of a local business man. Just like that, Ledge’s beloved normal life is over. Now, he has to keep Sarah from turning family secrets into headlines, stop her father from foreclosing on Uncle Autry’s ranch, and scumble his savvy into control so that, someday, he can go home again. WaldenFans.com: What were your inspirations for the stories in the Savvy and Scumble? Ingrid: Initially, I was driven to imagine what American magic might look like–no wands, cauldrons, or potions. Some people have started calling what I do ‘rural magic.’ But from the beginning, I wanted to create stories about magical children but never actually use the word ‘magic.’ I wanted readers to get the sense that a ‘savvy’ is something everyone has, that everyone has a talent, or something they are working to be good at. Ultimately, the books are about facing the challenges of growing up. The kids I write about simply face those challenges in a fantastical, tall-tale way. WaldenFans.com: What themes did you try to convey in the story? Ingrid: I enjoy coming-of-age themes, as well as themes of family, friendship, compassion, and self-awareness. WaldenFans.com: Are you excited at the potential film version of Savvy? Ingrid: Yes! I’m a huge movie fan. So, it’s very exciting to know that there’s potential for a Savvy film. WaldenFans.com: How do you feel about your characters coming to life? Ingrid: If the project continues to move forward, it will be fun to see how a whole team of creative and talented people choose to bring their vision of my characters and story to the big screen. WaldenFans.com: When and why did you begin writing? Ingrid: Long before I ever started writing my stories down, I had dozens of them in my head. I used to make up stories to entertain myself and to keep myself from getting anxious. I was often a very nervous child and I discovered that inventing stories and creating new worlds and characters kept me from worrying about everyday things. Eventually, I moved the stories out of my head and onto paper. WaldenFans.com: When did you first consider yourself a writer? Ingrid: Probably when I finished my first novel-length manuscript when I was about 20. It was a big accomplishment. But I was a merely a hobby writer off and on for years before I got serious about the craft and attempted to get something published. WaldenFans.com: Are there any new authors that have grasped your interest? 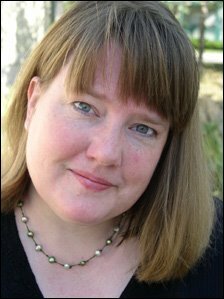 Ingrid: Anne Ursu is not a new author, but she does have a new book coming out (from Walden Pond Press) that has grasped more than just my interest, it has stolen my heart! The book is called BREADCRUMBS. It’s fabulous. Watch for it this coming fall! WaldenFans.com: Who designed the covers? WaldenFans.com: What was the hardest part of writing the Savvy series? Ingrid: One of the trickiest parts about writing these books is striking just the right balance between the fantasy and real-world conflicts, as well as the internal versus external conflicts. There is no evil super villain the kids have to defeat. They do not have to save the world. They are concerned with family and friends and with learning about who they are, inside and out. The kids need to face everyday challenges in both everyday and extraordinary ways–all while having some larger-than-life adventures! WaldenFans.com: Did you learn anything from writing the Savvy series, and what was it? Ingrid: I believe every experience gives us the opportunity to learn. I learn more about myself and the world whenever I write. Even though my books are considered fantasy, I do a lot of research and I visit the places I write about, seeing and learning all sorts of unexpected things. WaldenFans.com: Do you have any advice for other writers? Ingrid: My best advice for any writer, young or old, is: 1) Be brave–write what you love! 2) Read a lot. Good readers make great writers. And, 3) Have fun with your first draft, then be willing to work hard and revise, revise, revise. WaldenFans.com: Finally, if you write a 3rd book in the Savvy series, do you have ideas for the direction you’d like it to go? Ingrid: I plan to switch again to the viewpoint of another character–most likely to that of Gypsy Beaumont. A lot of kids want to know why I choose to do this instead of sticking with the POV of the character they got to know and love in a previous book. The answer is that it gives me the opportunity to explore the idea of having a savvy birthday–of finding one’s center through the process of growing up and changing–from a variety of perspectives. There are so many different kinds of kids in our world, each one with his or her own challenges. I want to show that that is the case with my magical ‘savvy’ kids as well. I really liked the book Scumble. I thought it had a good lesson and good cliff hangers. I loved Scumble. Though I haven’t read Savvy yet, I’m hoping for book three. i read the books like 5 times write another please and included the familiar characters more often like ledge mibs and rocket. When will the third book in the savvy series come out? I really want to know! Is the third book almost done? Please reply!!!!!!!!!!!!!!!!!!!!!!!!!!!!!!!!!!!!!!!!!!!!!!!!!!!!!!!!!!!!!!!!!!!!!!! !